AVANGRID, Inc. is a diversified energy and utility company with 7,000 employees, $31 billion in assets and operations in 23 states. Formed from the 2015 merger of Iberdrola USA and UIL Holdings Corporation, AVANGRID remains an affiliate of the Iberdrola Group, a worldwide leader in the energy industry. In 2012, the company’s leadership recognized the need to become more agile in order to quickly respond to the unique challenges of a global company as well as the evolution of the utility industry (smart grid, system automation, etc.). Change management became a key strategic initiative. “The AVANGRID/Prosci partnership is very rewarding. Prosci’s team is knowledgeable, responsive, and consistently seeks to evolve the change management discipline through quality research and benchmarking. Their three-day base certification program is one of the best trainings I have experienced in my career! - Diane M. Schreiner, Director of Change Management at AVANGRID, Inc.
To mobilize people to become more agile in a rapidly changing industry. Initially, the Change Management Office selected a pilot Wellness initiative, a larger Operational Excellence project and an enterprise-wide global SAP implementation. The SAP implementation impacted 4,100 employees and required significant changes for many departments. By completing very thorough and well-documented change management plans and regularly reporting demonstrated successes, the Change Management Office quickly gained the trust and respect of leadership, both within the U.S. and in their parent company, Iberdrola. During the initial meeting with the Change Management Office and the management steering committee, the team came prepared to demonstrate the results of change management efforts, and these updates ultimately became an integral part of the meetings. The SAP implementation went live in January of 2015 and was considered a huge success, with only 10% of employees requiring refresher training. In addition to the success of the SAP implementation, AVANGRID saw significant growth in change management maturity. Using the Prosci Change Management Maturity Model as a gauge, AVANGRID began its journey to change management capability in 2013 with a Level 1 maturity, meaning that the organization had ad hoc or absent change management. Today, the organization is securely in Level 3 maturity and well on its way to achieving Level 5, the highest maturity level. With over 30 certified change management practitioners throughout the organization, the Change Management Office has a goal of having over 50 certified practitioners by the end of 2018. 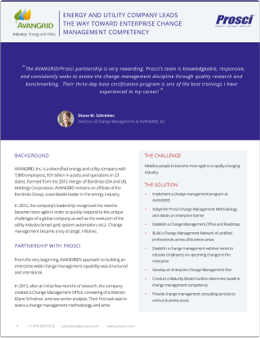 Learn how the AVANGRID change management team built a change agent network and leveraged Prosci's public training programs, and discover more of the results they have seen, when you download the full story as a PDF. Client Success Story: AVANGRID, Inc. Leadership at AVANGRID, Inc. recognized the need to become more agile in order to quickly respond to the unique challenges of a global company as well as the evolution of the utility industry.